Camille (1936) is one of the most romantically-atmospheric films ever made. It is a tearjerker classic - a well-known, lavish, luxuriously-mounted, melodramatic love/tragedy of Hollywood's Golden Age. Director George Cukor's film, his first with Greta Garbo, was also the first talking version of the content. It was adapted (by Zoe Akins, Frances Marion, and James Hilton) from Alexandre Dumas Fils' (the Younger) 1852 novel/play (La Dame aux Camelias) of the doomed romance of a tubercular courtesan/demimonde of ill repute in 19th century Paris. [Verdi wrote the opera La Traviata based upon this play.] Thirty-seven year old producer Irving Thalberg died shortly before filming ended for his last project with MGM. 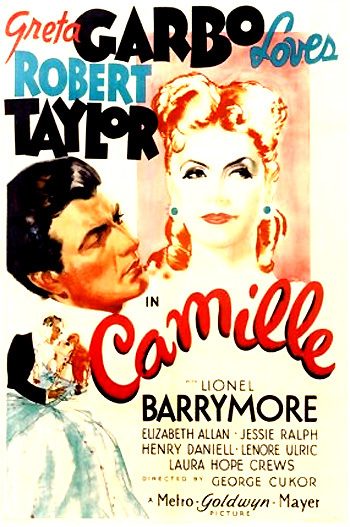 Garbo's portrayal of the beautiful but sickly Parisian courtesan, who fatefully falls in love with a young French nobleman (25 year-old Robert Taylor), is widely considered the definitive version of the Camille story. Garbo's first talkie film, Anna Christie, was advertised with the promotional line: "Garbo Talks!" - so naturally, jokes at the time suggested that this film should be advertised as: "Garbo Coughs!" Cukor (who had already directed the classic Dinner at Eight (1933), and would go on to make further screen greats such as The Philadelphia Story (1940) and My Fair Lady (1964)), captured the most exquisite, poetic, restrained performance of the great screen actress. In her most popular and luminous film, Garbo was recognized for her performance with the film's sole Academy Award nomination, but she lost to Luise Rainer who won for another, heavily-promoted MGM classic, The Good Earth. The title role character in this tearjerker was immortalized and based upon one of Dumas' actual acquaintances in Paris - a youthful courtesan named Marie Alphonsine du Plessis who died at the age of twenty-four (of tuberculosis). Throughout many years of stage and screen performances of the Camille tale, the heroine had been played by various leading ladies on the screen, including Oda Alstrup (1907), Gertrude Shipman (1912), Sarah Bernhardt (1912), Clara Kimball Young (1915), Theda Bara (1917), Alla Nazimova (in a 1921 film with Rudolph Valentino), Norma Talmadge (1927), Yvonne Printemps (1934 in a French production), and others on the stage including Eleanora Duse (a debut performance in 1893), Tallulah Bankhead, Ethel Barrymore, and Eva Le Gallienne. In the gay half-world of Paris, the gentlemen of the day met the girls of the moment at certain theatres, balls and gambling clubs, where the code was discretion - - but the game was romance. This is the story of one of those pretty creatures who lived on the quicksands of popularity - - Marguerite Gautier, who brightened her wit with champagne - and sometimes her eyes with tears. And there's no limit to your extravagance. Now you won't be young forever. It's high time you settle something about your future. And I know the very man for you. Prudence recommends Baron de Varville (Henry Daniell) - "one of the richest and most elegant gentlemen in Paris." Marguerite scoffs at the age of the proposed suitor: "One foot in the grave, I suppose, and a wig on his head." Not so, says Prudence: "He's young and handsome," and she plans an arranged introduction during their evening together at the theatre. There will be a seat in Box A for M. Le Baron de Varville with a certain lady who hopes he will honour her with his presence. Olympe: If you don't stop being so easy-going with your money, you'll land in the gutter before you're through or back on that farm where you came from milking cows and cleaning out hen houses. Marguerite: Cows and chickens make better friends than I've ever met in Paris. Marguerite: Are you following me? Armand: Yes, you, well you did smile at me a moment ago, didn't you? Marguerite: Well, you tell me first whether you smiled at me or at my friend [Olympe]. Marguerite: You didn't even see her? Armand: I was just wondering if you'd ask me to sit down if I knocked at the door of the box. Marguerite: Why not? We really seemed fated to meet this evening, didn't we? Armand: Fate must have had something to do with this. I've hoped for it so long. You don't believe me. Armand: The first time I saw you was a year and a half ago. You were in an open carriage and dressed in white. I saw you get out and go into a shop in La Place de la Bourse. Marguerite: Yes, it might have happened. I used to go to a dressmaker in La Place de la Bourse. Armand: You were wearing a thin dress with miles of ruffles, a large straw hat, an embroidered shawl, a single bracelet and heavy gold chain. And, of course, the camellias at your waist. Marguerite: You have a marvelous memory, haven't you? Marguerite: Well, tell me, if all you say is true, why have you never spoken to me before? Armand: In the first place, I didn't know you. Marguerite: You didn't know me tonight. Armand: No, but after you smiled at me, I knew you wouldn't mind. Marguerite: And now, since you've met me? Armand: Now I know that I love you - and have loved you since that first day. When Prudence arrives, Marguerite realizes, with slight embarrassment (calling it "jolly funny") and self-awareness, that the man she has frivolously fallen in love with is not the wealthy Baron de Varville. Armand is uneasy and disappointed, speculating that she had become interested in him only for his presumed wealth. Marguerite: Even if you're not Baron de Varville, sit down. Armand: I can scarcely believe I'm wanted now that my unimportance has been discovered. Marguerite: Don't be silly. Who are you, anyhow? Armand: My name is Armand Duval. I've never had any reason to be ashamed of it. Marguerite: (with a touching smile) Oh, Armand Duval. I'm not always sincere. One can't be in this world, you know. But I am not sorry the mistake happened. I was delighted when I saw that you were alone. When Armand finally returns with the bonbons from the confectioners, the theatre box is empty - Marguerite has already departed with the Baron. He discovers her left-behind handkerchief, views it longingly, and pockets it. Marguerite: Now what shall I give you to remember me by? Baron: You can't give me anything I'd like? Baron: A tear. You're not sorry enough I'm going. Marguerite: (in a very affected, hypocritical tone) Oh, but I am sorry. Baron: Is there anything I can do for you before I go? Marguerite: (She accepts his money) Thank you. Gaston: You really have a heart, Marguerite. Olympe: Yes, it's gonna cost her a lot before she's through. I hope mine never gets that soft. Gaston: Don't worry, it won't. Prudence: It's a great mistake for any woman to have a heart bigger than her purse. Marguerite: You seem to think that's very fine of him. Nichette: But of course I do. After all, I've no dowry, and he's a gentleman and educated. Marguerite: Even so, why should the mention of marriage go to your head? Nichette: Marguerite, it's ideal to love, and to marry the one you love. Marguerite: (She laughs) I have no faith in ideals. You suit yourself as you wish. But remember, you can always do better than a penniless young lawyer. Nichette: I never want to do better than Gustave. Marguerite: Well, well, time changes our minds as well as our hearts. (playfully) Perhaps you won't go on being a little goose always. Only come and see me now and then. Remember, you're my oldest friend in Paris. In addition to her self-immolating love affairs, Marguerite has been suffering from a tubercular condition. Jocular about her health, she confesses to Nichette: "I always look well when I'm near death." Marguerite: And you kept it with you all this time? Armand: Always with me, like an old friend - to remind me that I'm not the Baron de Varville. Marguerite: Hmm. Not a very romantic reason. Armand: No, I kept it as a warning against romance. Marguerite: How sensible! Has it made you very cynical? Marguerite: Is that why you've never taken the trouble to call on me? Marguerite: I'm sorry. One needs friends. Marguerite: (She grasps his hands) You might have asked to see me. Armand: Well, I knew there were so many others. Marguerite: There were no others, none, during all those weeks the doctors thought I might die. Armand: Not even Baron de Varville? Marguerite: Baron de Varville chose to be in England at the time. No, you were the only one that took the trouble to ring my bell. Marguerite: Oh, now I'm well again, and all goes merrily. I'm afraid of nothing except being bored. Armand: A beautiful girl who lived for love and pleasure. Marguerite: It's a beautiful color. It should be a very good story. Armand: Yes it is, but it's rather sad. She dies in the end. Marguerite: Well then, I'll keep it but I won't read it. I don't like sad thoughts. However, we all die, so perhaps this will be sold again someday at an auction after my death. Armand: I thought you didn't like sad thoughts. Marguerite: (defusing her melancholy) I don't, but they come sometimes. Well, no fair, tell us all...I want to laugh too, tell me the story. Marguerite: Oh, it's you. What's happened? You look ill too. Armand: No, it's seeing you like this, suffering. Marguerite: It's nothing. It lasts only a minute. Marguerite: If I am, you're the only one who objects. Now, why don't you go back and dance with one of those pretty girls. (She laughs) Come, I'll go with you. (He embraces and kisses her hand.) What a child you are. Armand: Your hand's so hot. Marguerite: Is that why you put tears on it and cool it? Armand: I know I don't mean anything to you. I don't count. But someone ought to look after you. And I could if you'd let me. Marguerite: Too much wine has made you sentimental. Armand: It wasn't wine that made me come here every day for months to find out how you were. Marguerite: No, it couldn't have been wine. So you'd really like to take care of me? Marguerite: All day, every day? Marguerite: Why should you care for a woman like me? I'm always nervous or sick, or sad or too gay. Armand: I do care for you. Marguerite: You know what you should do. You should get married. Ah. Come, come. You're young and sensitive. The sort of company you're in tonight doesn't suit you at all. Marguerite: No. These are the only friends I have and I'm no better than they are. However, I've given you some very good advice. (She extends her arm to guide him.) Now let's go back. (She notices his hesitation and laughs.) Oh, what on earth am I going to do with you? Armand: (He repeats his protestations of love while grabbing her tightly.) No one has ever loved you as I love you. Marguerite: That may be true, but what can I do about it? (She halts his urging to kiss her.) You should go away and not see me anymore. (He turns away to leave.) But don't go in anger. Well, why don't you laugh at yourself a little as I laugh at myself, and come and talk to me once in a while in a friendly way? Armand: That's too much and not enough. (He holds her hand.) Don't you believe in love, Marguerite? Marguerite: I don't think I know what it is.